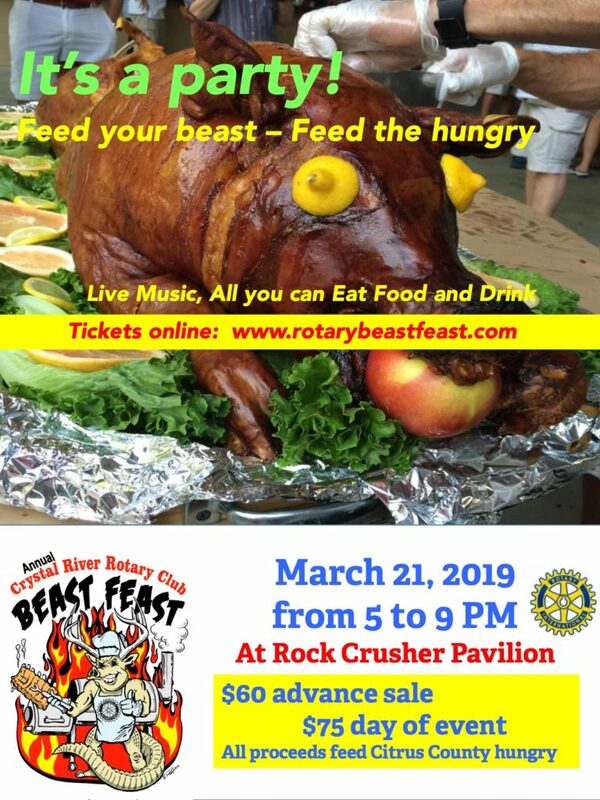 The Rotary Club of Crystal River’s BEAST FEAST is a fun filled night (Thursday, March 21, 2019, 5PM to 9PM) benefiting hunger in Citrus County. The 6th Annual Beast Feast will include all you can eat beasts; like whole hogs, buffalo, gator ribs, ribs, brisket, chicken, seafood and pulled pork. Also featured will be an open bar, craft beer, music, mechanical bull ride, and a laser target range, door prizes and 50/50. We at the Rotary Club of Crystal River would like to extend our gratitude to all of our sponsors who supported the 5th Annual Crystal River Rotary Club Beast Feast. There were more than 900 patrons in attendance this year and through your support we were able to raise more than $30,000 to support the fight against hunger in Citrus County! 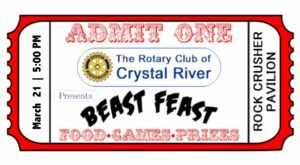 Proceeds from the 2019 Beast Feast will go to Citrus County Blessings (take home weekend food for school children), Community Food Bank (feeding the hungry), and The Path (homeless shelter). 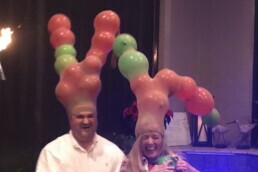 We will expand our fruit grove in conjunction with The Path to help feed Citrus County’s poor with good quality produce. Fresh fruits and vegetables are a key missing ingredient in their diet.